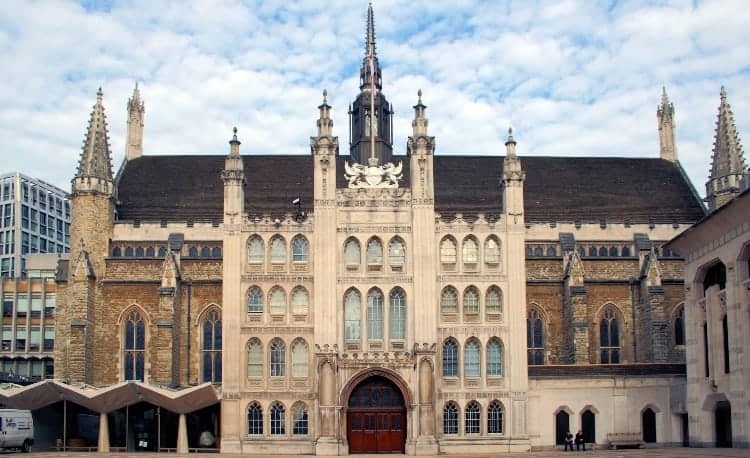 This iconic church was designed for the rebuilding of the City of London after the catastrophic fires of London in 1666 and it remained the largest building in London from its construction up to 1967. Unusually its crypt is underneath the entire building as opposed to just one and this building along with the Old Royal Naval College, Greenwich, remains one of Sir Christopher Wren’s most famous works. This beautiful building stands out from the surrounding structures owing to it’s rare 15th Century Architecture and it is one of the oldest non-ecclesiastical stone buildings in the City (behind the Tower). It’s current roof only dates back to 1954 owing to the Second Fire of London caused by the Germans on 29th December 1940. While the building is impressive to look at, what lyes beneath is even more astounding. Below ground it has more space that the 3rd tallest building in the area, Tower 42 (the old National Westminster building). Along with the UK, 30 other countries store their gold here and it is believed that it’s vaults contain approximately 3% of the gold mined in the entirety of mankind’s history. This complex has twice been destroyed by fire and the complex you see today dates back to 1844. The interior structure contains one of the early examples of concrete being used as a building material again after that knowledge was lost during the dark ages. Thomas Gresham founded the first Royal Exchange here in the 16th Century and his family crest of a grasshopper is represented today as a weathervane on top of the building. His statue stands nearby. This UNESCO world heritage site is the most popular tourist attraction in our country. Historically control of this tower has meant control of the country and it has been besieged many times. It is the best example of 12th Century Norman architecture and now houses the Royal Family’s Crown Jewels. This marvellous feat of Victorian engineering is one of the most photographed bridges in the world and it’s easy to see why. Completed in 1894, this is the last Bridge spanning the Thames until you get to the Queen Elizabeth II Bridge at Dartford. Standing on the centre of Roman London, the market here dates from the 14th Century and is one of the oldest markets in London. The structure that we see today dates back to 1881 and had a major overhaul in 1991 which gave it it’s current appearance. The 2012 Olympic Marathon passed through here and there are many fine bars here. The route of the old London Wall largely defines what we today call the City of London. Originally built by the Romans to protect Londinium, it was restored and updated during the Medieval period and it’s the surviving parts of this that we can still see today. This interesting garden is the largest park within the City of London. Originally a graveyard, in 1900 the park become home to The Memorial to Heroic Self Sacrifice. This was an interesting initiative to ensure that those who made the ultimate sacrifice under what many would consider an ‘ordinary’ day would not be forgotten. The blend of architecture is diverse and effectively unrivalled. Two major catastrophes did much for land-clearance around here: The Great Fire of London, and the Blitz. The buildings that survived these two purges now stand alongside ultra-modern architecture in the form of skyscrapers.